Among the top rankings for the highest-level of production among real estate teams nationwide, LORE (Lives of Real Estate), presented by The Wall Street Journal and Real Trends, has ranked Andy Allen's Team as high as 15th in the nation out of all real estate teams for all companies. The Andy Allen Team won the Citywide award for top sales, presented by the Austin Business journal multiple years. With a strong presence in the Luxury Home market, Andy's team can offer the same unparalleled service in all price ranges. As the sole representative in the Austin MLS area for Builder Trade-in Program, Andy's Team offers options not available with other agents. 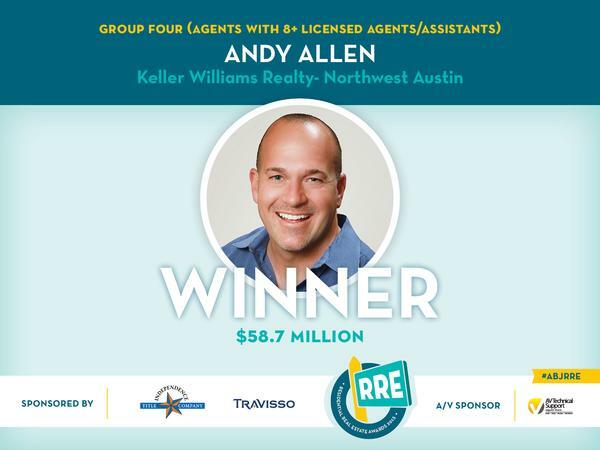 Having sold over 100M in Austin real estate in a single year, Andy's Team is your best solution for selling or buying in and around Austin. Keller Williams was founded in Austin in 1983 on one simple premise: buyers and sellers deserve the very best professional service for their real estate needs. Our emphasis on customer service has been a major factor in our continued growth. Keller Williams' real estate and marketing knowledge is power for buyers and sellers. Daily market research and information updates gives us the current knowledge needed to help our buyers make sound decisions. We understand the factors that contribute to a successful marketing program and will make certain that these factors work to our sellers' best interests. Keller Williams' expertise is a force that the public has come to count on for successful real estate transactions. Commitment to service has made Keller Williams a sophisticated brokerage company which is committed to our clients' and customers' real estate needs. We listen to our buyers' and sellers' special requirement, and then work tirelessly to fulfill them. Our ability to deliver quality service is reflected in the list of major corporations, including many Fortune 500 firms who have chosen Keller Williams to handle their relocation requirements. Our service is guided by a willingness to provide personal attention to each and every client and customer. The success of Keller Williams is a reflection of the responsive and courteous service that has become our hallmark. When we commit to a real estate transaction, our work is supported by a dynamic program of market research and training. The creative and attentive handling of the many details is the cornerstone of our professional service. The key to our professionalism is our large team of seasoned sales associates, ready to meet any challenge. Our depth of expertise assures that our customers and clients will have the very best in professional representation. From the moment we begin working with a customer, our professional image goes to work for them. First, the real estate community enjoys doing business with us because they recognize Keller Williams as a top professional company. This strong reputation in the real estate industry creates a cooperative atmosphere that improves a client's ability to transact business. Find out about Buyers' & Sellers' Representation or fill out the form below to be contacted about our services. Last updated April 24 at 12:05 am.